Gollum in front of his new ring shop. In High School I never read the assigned books. Going into 8th grade we were given The Hobbit as our summer reading, and I guess I was bored enough to actually open it. Well I was obsessed. The book was full of adventure, and I couldn’t get enough. The first day back we were quizzed on the reading, and I got a 100%. I never got perfect scores even when I did read the books. As you know from The Little Mermaid post, I enjoy fan fiction. My contribution to the fan fiction world is branding and what I would imagine Gollum’s business to be. 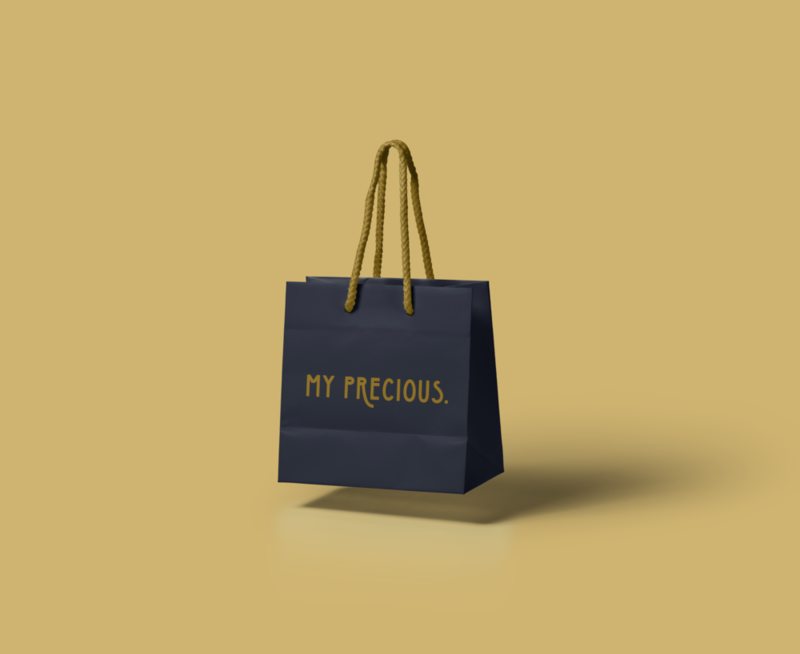 I’m sure you could have guessed it but in this scenario, Gollum owns a jewelry store called My Precious. I wanted a gold ring to really be the focus of this logo in a clean and simple way. But then I found the font, Clethons Djoice and honestly, that became the star of the show. 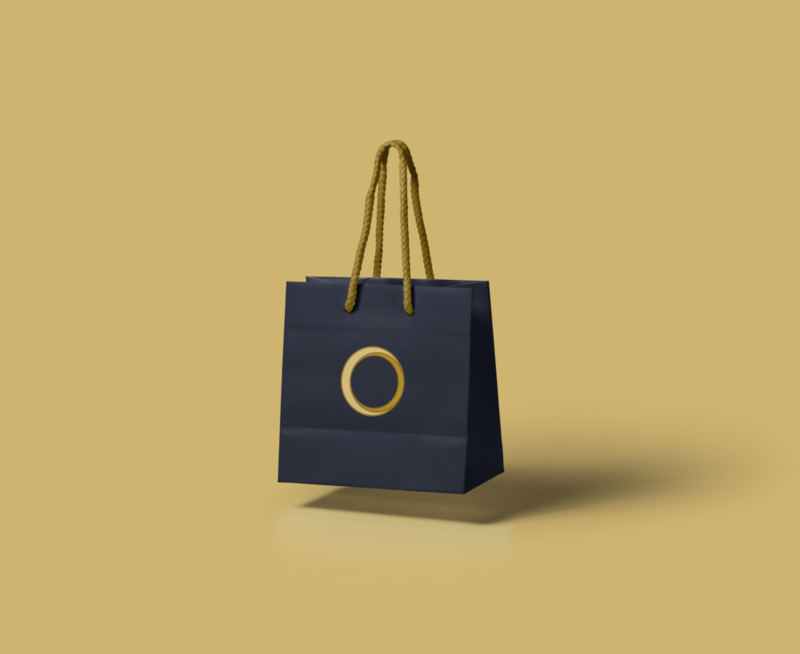 Dark gold is one of my favorite colors to use for a luxury brand. With a jewelry brand, whether you’re expensive or not, you still want your brand to exude luxury. This way your clients will always feel like they are buying something expensive, even if they’re not. I also wanted to pair this with a dark color for two reasons. The dark adds to the luxury but Gollum also lives in a dark damp cave. I wanted that part of his story in the brand as well. I wanted to add a riddle element to the branding and added a sweet riddle about a ring (and marriage) as part of the messaging. There are a lot of logos that use the logo mark within the logo type. In this case, that could be using the ring logo in the word precious and replace the “o” for the ring. I liked that idea, but the ring didn’t look as great as I hoped. But I found a solution. I thought about two other words that could compliment precious that have an "o” in the word. We’re turning Gollum into a sappy love monster haha! So what does this brand look like in the wild? For all my clients (Gollum included) I show them what their branding options would look like when brought to life. Would you buy a ring from Gollum?